What’s Bite Got to Do with It? “Bruxism” is the dental term for the habitual, involuntary clenching and grinding of teeth, often during sleep. It’s also pretty common. Physical and psychological stress are often the main culprits, but a variety of other factors have been suggested, too, including sleep disorders, SSRIs and other drugs, even parasitic infection. Many have thought bruxism can result when a person’s teeth don’t come together (occlude) properly – an attempt to self-correct the problem, even if it means wearing down the teeth for a more comfortable bite. Instead, there is a growing awareness of other factors (viz. psychosocial and behavioural ones) being important in the aetiology of bruxism. What’s more, malocclusion (“bad bite”) may not even play a “mediating” role between the grinding and the damage it does. Even though most dentists agree that bruxism may have several adverse effects on the masticatory system, for none of these purported adverse effects, evidence for a mediating role of occlusion and articulation has been found to date. 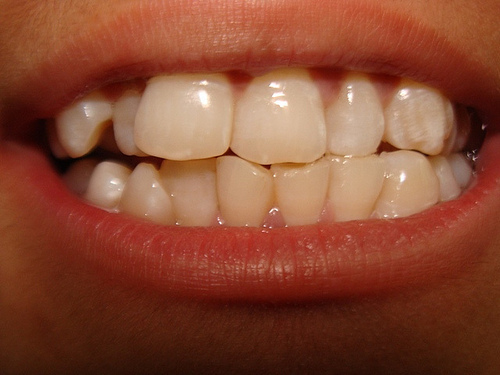 Of course, malocclusion and bruxing can and do occur together. It’s just that there may not be a causal relationship between them. For the individual who grinds, though, that may make little difference. What they know is how it affects them – the headaches; the face, neck and shoulder pain; the damaged teeth; the receding gums and tooth sensitivity; and so on. Usually, it’s the pain that leads people to seek help. One of the most common and conservative measures for bringing relief is splint therapy, in which a special appliance is used to cushion the forces of bruxing. Since most grinding occurs during sleep, they’re often called “night guards.” Unfortunately, the mass market ones you can buy in a store are often of little help to serious bruxers. They grind right through them pretty quickly. Their fit can often be poor, as well, causing problems such as discomfort, damaged gums or increased clenching. A custom splint provided by your dentist will fit your mouth precisely and normally last much longer. Comments Off on What’s Bite Got to Do with It?